The Mormon Pioneer National Heritage Area, MPNHA has partnered with Map-N-Tour to to share the story of the people, places, and events that have shaped central and southern Utah. We look forward to offering this mobile app experience with the thousands of people who live in or drive through the heritage area. We encourage you to download The Story Road Utah Mobile App, give it a test drive, leave reviews or feedback, and share with your friends and family. Follow Story Road Utah on Facebook for exciting new stories as they become available. Story Road Utah is available via your favorite app store – Click here for iOS and Android devices. Although similar in name, Story Road Utah is not affiliated with our exceptional television show, “Discovery Road.” As viewers of “Discovery Road are aware, the communities within the MPNHA boundaries are rich with stories, landmarks, and history. As an additional way to share these with our users, the addition of Story Road Utah is a natural fit. For more information about “Discovery Road” for those not familiar with its body of work, watch for it on public television (UEN) as well as see episodes on YouTube. We this partnership with the MPNHA and Story Road Utah as a natural and valuable extension in a mobile app experience. Click the map image below to view the interactive map on your personal computer. 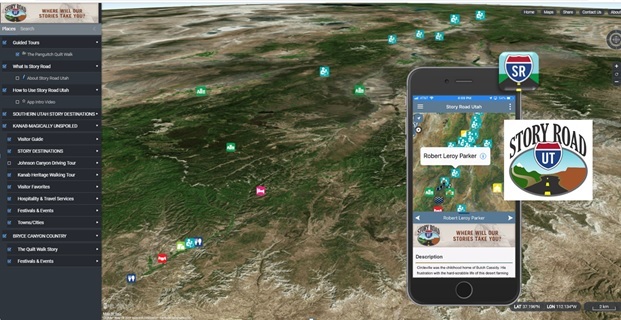 Download the Story Road Utah app to get the complete mobile experience.